Dwayne Evans and the Billikens are looking to improve to 5-0 on the road this season when they visit Rhode Island on Tuesday. ST. LOUIS — Opening conference play at Rhode Island figured to be challenging enough for the Saint Louis Billikens. After all, the five seniors who make the Billikens go still are looking for their first victory against the Rams. SLU’s task is looking even tougher since Saturday, when Rhode Island (9-6) pulled out an impressive 74-70 victory at LSU. Leading by six at the half, the Rams then fell behind in the second half but managed to pull ahead and hold off the Tigers and end their six-game winning streak. "Our confidence is rising," said coach Dan Hurley, in his second season at Rhode Island. The son of legendary high school coach Bob Hurley and the brother of former Duke star Bobby Hurley (now coaching at Buffalo), Dan Hurley appears to be having no problems recruiting to the Kingston outpost. Three freshmen and a transfer have joined Xavier Munford, a second-team pick on the all-conference preseason team, in the starting lineup. One of the freshmen, point guard E.C. Matthews, was considered a top 100 recruit at Romulus (Mich.) High where, teaming with Missouri freshman Wes Clark, he led the team to a state championship last year. 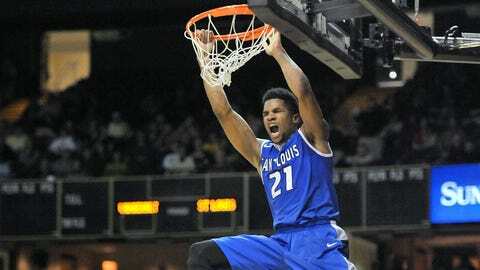 Matthews scored 21 against LSU and was named Atlantic 10 Rookie of the Week. Munford was named Player of the Week after going for 17 against LSU and 25 against Brown. The 6-foot-2 senior led Rhode Island’s 82-80 overtime upset at SLU last year with 24 points. SLU changed its starting lineup after that loss, inserting Grandy Glaze, and would run off an 11-game winning streak. "We made some ridiculously difficult shots last year and maybe snuck in there," Hurley said Monday on a conference call. "I don’t think that will be the situation when they come here. This will be a huge challenge. They’re consistent in everything they do at both ends and they do a great job of taking you out of the things you want to do." The Billikens practiced Monday morning before heading for Rhode Island. The team is not planning to return home until after Saturday’s game at Dayton. "Our guys like playing on the road," SLU coach Jim Crews said. "I don’t know if they have better pillows on the road than in their apartments but seriously, they enjoy going on the road." Look for the Billikens, ranked seventh in the nation in scoring defense (57.5 points), to be able to use their experience to harass the young Matthews and Rhode Island’s backcourt. SLU is second in the conference at forcing turnovers; Rhode Island has made more turnovers than all but two teams in the Atlantic 10. Massachusetts was the only conference team to lose only once in non-conference play and, after not getting a mention in preseason polls, the Minutemen have climbed to 19th in the AP Top 25. But the Minutemen, picked to finish fourth in the conference, were supposed to be good. George Washington, not so much. After going 7-9 in conference last year, the Colonials did not garner much respect in the conference’s preseason poll, where they were picked 10th out of the 14 teams. But improved play in the backcourt, led by transfer Maurice Creek, has helped GW (12-2) to the most surprising start in the conference. The Colonials own wins over two ranked teams, Creighton and Marquette, and have rated a mention among the "others" in both the AP and Coaches polls. Creek, a 6-5 guard, began his career in 2009 at Indiana, where he started his first 12 games before injuries derailed him. He missed one entire season and significant time in two others and by last year, he averaged 1.8 points in limited minutes. But Creek, who already has earned his degree, caught a break when he was allowed to transfer without having to sit out a year because of academic reasons. He is making the most of his new opportunity. Creek leads GW with a 16.0-point average, having scored nearly half of his points on 3-pointers. Improved 3-point shooting is the biggest reason for the Colonials’ turnaround. They are making 5.9 3s per game while shooting 38.5 percent, dramatic increases over last season’s 2.8 and 27.9. Based on a convincing victory over Penn on Saturday, La Salle might have figured out what was going wrong with its season during an extended holiday break. The Explorers needed something after a disappointing start. The preseason pick to finish third in the Atlantic 10, the Explorers (7-6) needed to beat their Philly rivals Saturday to enter conference play with a winning record. Shooting has been their main downfall. La Salle is shooting a conference-worst 40.6 percent after finishing last season at 45.1 percent, third in the Atlantic 10. Other than the emergence of George Washington and La Salle’s lackluster start, little happened in non-conference play to require an overhaul of the preseason picks for conference play. The top teams still are seen as VCU, Massachusetts and Saint Louis, with the three separated by no more than a coin clip. The bottom three of St. Bonaventure, Fordham and Duquense remains the same, too, with St. Bonnie moving ahead of Fordham based on a 10-4 start. That leaves seven teams bunched in between. My order: George Washington, Dayton, La Salle, St. Joseph’s, Richmond, Rhode Island, George Mason. Though the Atlantic 10 has been largely overlooked in the AP and Coaches Top 25s, the conference fares well in the more important Ratings Percentage Index. Seven A-10 teams ranked in the top 100.